Greetings once again – what a week we IGERTs have had! Our communication has been limited the past week as we’ve been immersed in our latest adventure, 5 nights of camping at the ice margin! We’ve now arrived back in Kangerlussuaq, where we’ll spend a couple days re-grouping before our flight on Monday to the capital city, Nuuk. Until then, we thought we’d give you a little recap on how we spent our days on this past camping excursion! 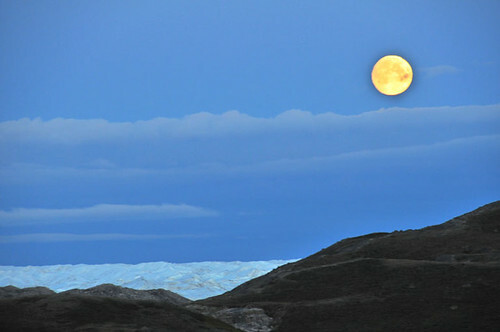 Goodbye Kangerlussuaq: Saturday morning we piled our personal packs, tubs of food, shovels, bug nets, microscopes, soil drill and inflatable zodiac boat into the back of two diesel trucks, and we started our journey up the long, winding dirt road to the ice margin! Admiring the view of Long Lake. Photo courtesy M. Ayres. Long Lake, en route to our campsite. Photo courtesy M. Ayres. 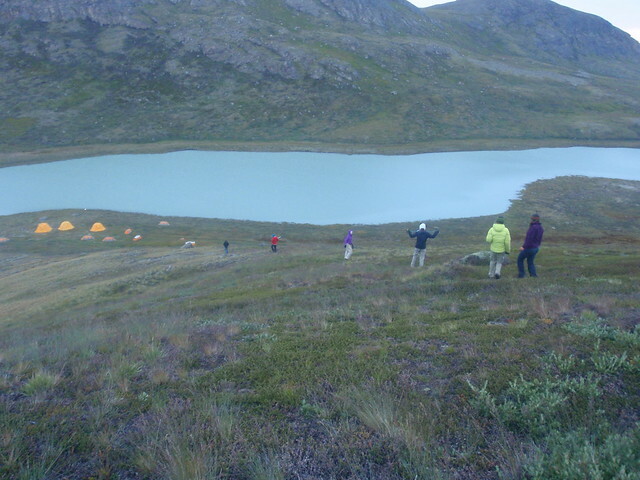 The group hikes out to one of Julia’s field sites along the edge of Long Lake. Photo courtesy M. Ayres. 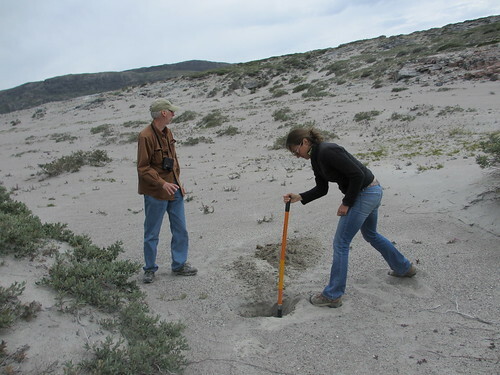 Our first stop was a visit to the field site where fellow IGERT student, Julia Bradley-Cook, is currently conducting research on the effects of factors such as moisture and vegetation type on soil respiration. 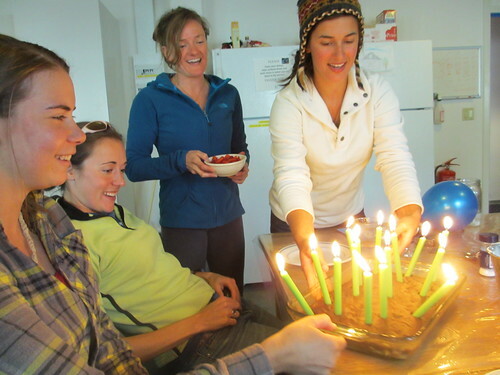 Julia demonstrates to the group how she and field assistant and Dartmouth graduate, Courtney Hammond, have been using an special infared gas analyzer, or IRGA, to measure soil respiration. Photo courtesy M. Ayres. After this, we pulled off the road in awe of the scenery at a site known as Sea Horse Lake. 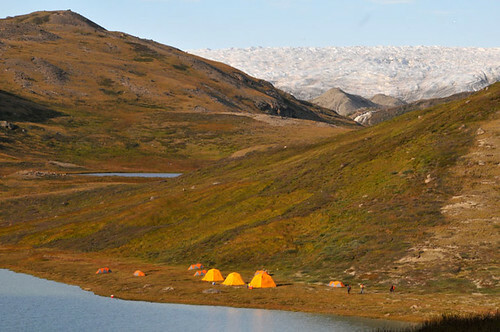 We were pleased to discover that this backdrop of interconnected, glacially fed lakes and rolling moraines was in fact our campsite! 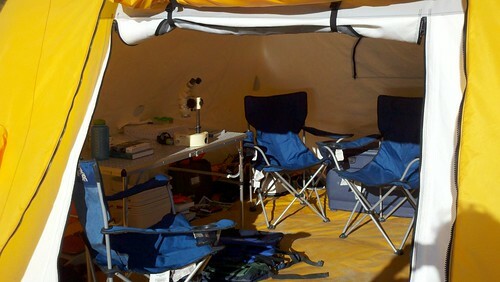 Thanks to the amazing work of the KISS and CPS (CH2M HILL Polar Services) staff, in addition to our personal tents, our camp was complete with warm, wind-resistant Arctic oven tents – so we had one designated kitchen tent, and one which we outfitted with microscopes, text books, and a whiteboard as our laboratory/classroom! 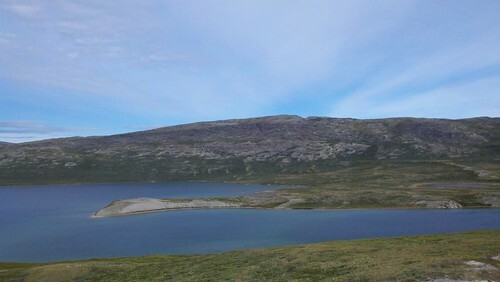 View of campsite by Sea Horse Lake. Not a bad place to call home. Photo courtesy M. Ayres. 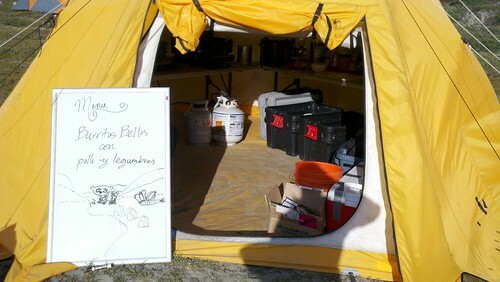 Our kitchen tent, with menu featuring the meal of the evening. Classroom tent, about to be used to identify aquatic organisms. 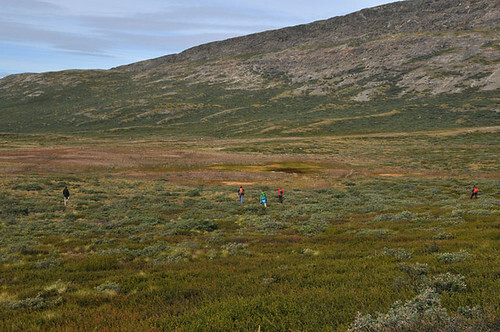 Soils galore: After a hearty breakfast of oatmeal, dried fruit, and French-pressed coffee, we headed to the moraines behind our camping site, where we got down and dirty in the tundra soil. Our resident soil experts, Chelsea and Julia, taught us how to takes soil cores, dig pits, interpret soil layers, and – thanks to Chelsea’s powerful auger and her professional drilling skills – even experienced drilling into the permafrost! Chelsea and Steph steady the auger into place as they prepare to take a soil core. Photo courtesy M. Ayres. 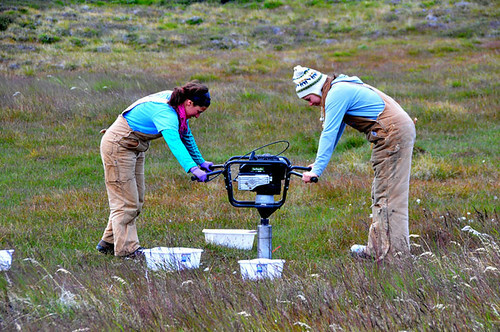 Working as a team, the group spent the day collecting soil cores from 10 different sites. 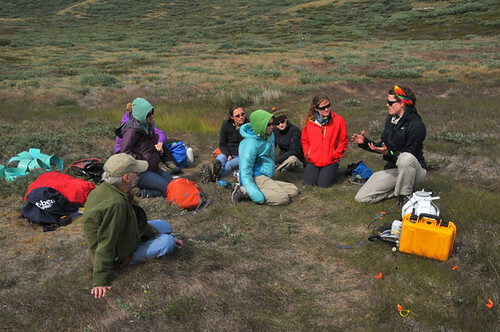 We took turns drilling, digging, measuring vegetation, sifting, weighing, and collecting soil layers, which they will take back to the lab at Dartmouth to ask questions about the biochemistry of the different soil layers, and carbon storage of the tundra. 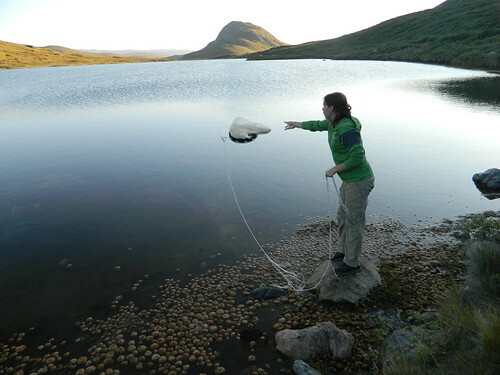 Arctic limnology: This morning, we rolled up the road about 10 minutes to the beautiful setting for two small lakes. 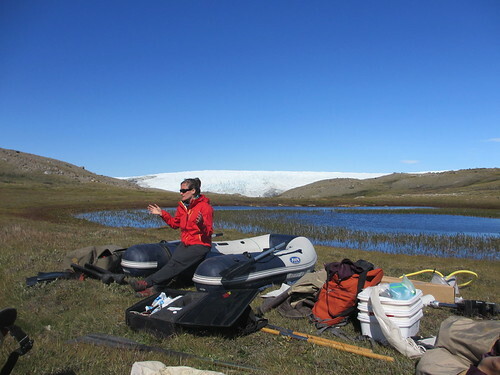 Here we pumped up our inflatable zodiac and donned our waders to study the plants and animals living in these arctic lakes. 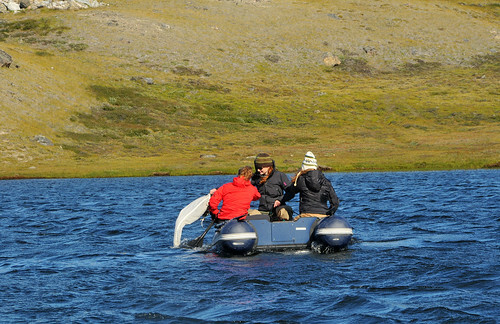 Battling the extreme winds that day made taking plankton samples and water chemistry measurements from the boat quite an epic journey! But we couldn’t have asked for a better backdrop. 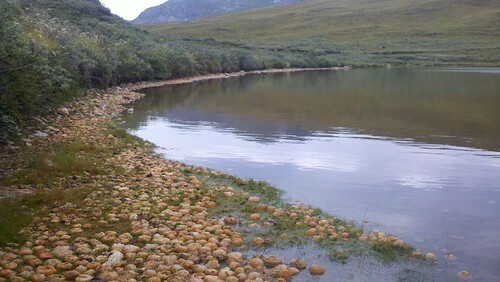 And we found some exciting species, which we will be sure to blog about in more detail soon. 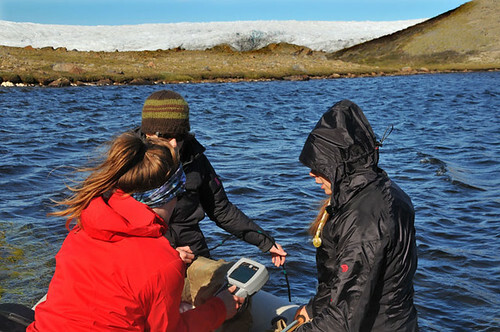 The zodiac team uses a multiparameter probe to take water chemistry measurements, such as temperature, pH, conductivity, and dissolved oxygen. Photo courtesy M. Ayres. Jess, Steph, and Ali paddle back in to shore. Photo courtesy M. Ayres. 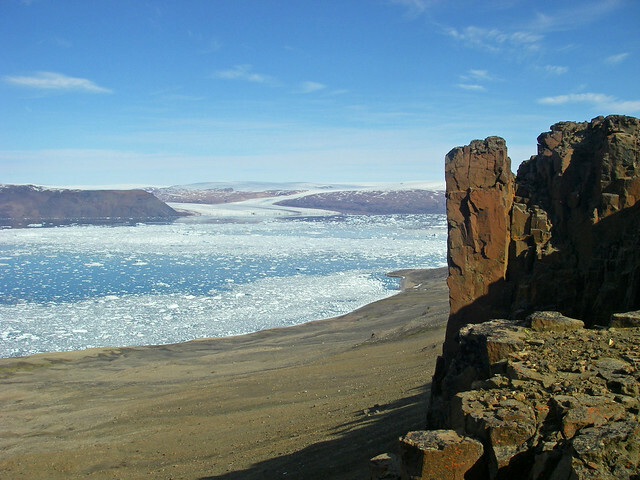 Edge of the ice: After some seriously stellar discussions led by our very own Lee and Ali on glaciology and glacial geomorphology, we spent Tuesday hiking and exploring the landscape at ice margin. 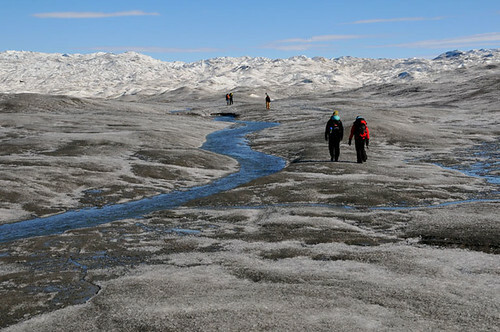 Walking through the moraine rubble we reached the ice edge, where we could actually see the transition from sediment, to films of sediment frozen in the ice, finally to solid ice extending as far as the eye could see. The features were amazing – ranging from quickly moving meltwater resembling wild winding ice luges, to deep murky holes of flowing water called moulins, which reached indeterminate depths. 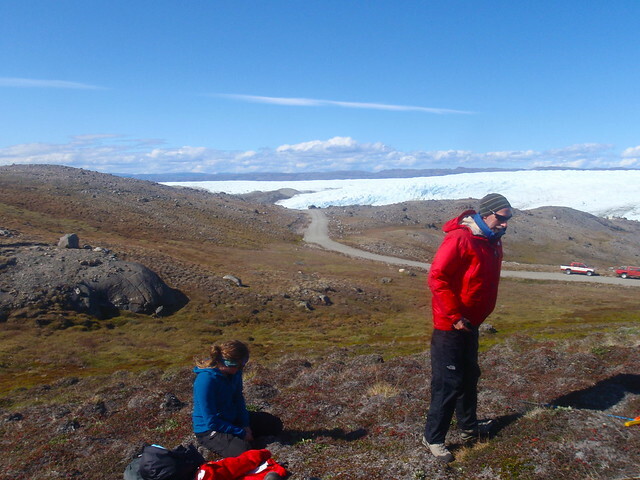 Lee and Ali prepare the group for the day by describing the physics of glacial movements and the many ways in which they shape the landscape. Photo courtesy M. Ayres. 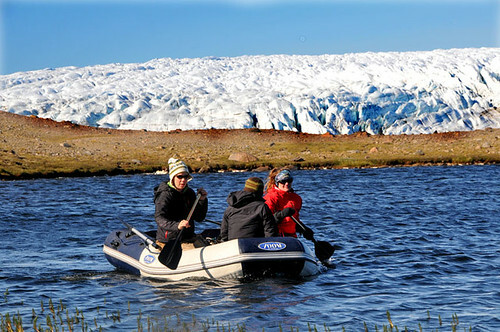 The group treks to the ice edge. Photo courtesy M. Ayres. 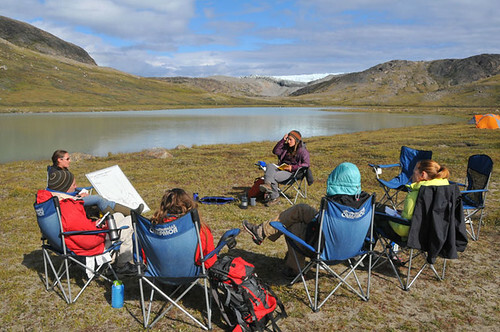 Spiders, calving, and Jerry Garcia: For our last full day, we started by delving into theoretical population ecology, and then applying it to the field by examining local insect populations on our way to the Russell Glacier. 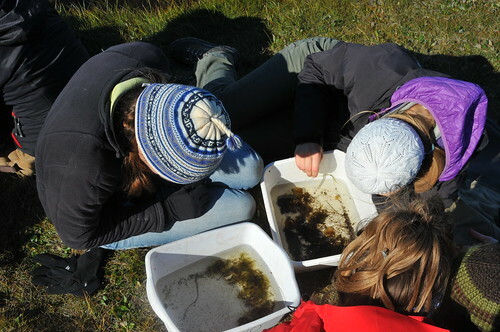 We all practiced proper sweep netting technique to catch a variety of insects, which we then aspirated into jars to examine under the microscope later. What a boom we found in the spider population since last year – more on this later! We stopped once more along the way through what is known as Vulgaris Valley after the aquatic plant found in the ponds there, Hiparus Vulgaris. 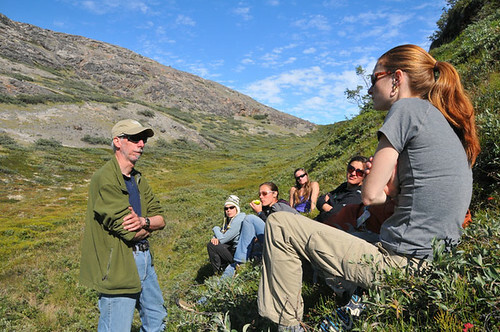 Here we discussed the effects of factors like temperature, landscape morphology, moisture, and organisms on soil formation, carbon storage, and how these processes connect to the global carbon budget. 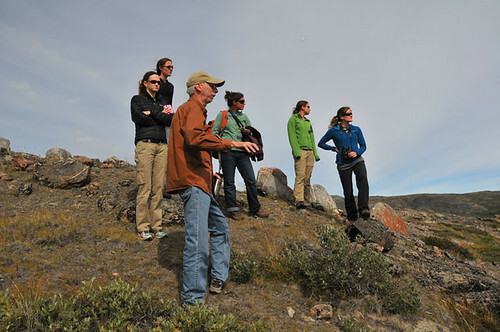 The group discusses factors affecting soil formation, such as temperature, moisture, and relief. Photo courtesy M. Ayres. 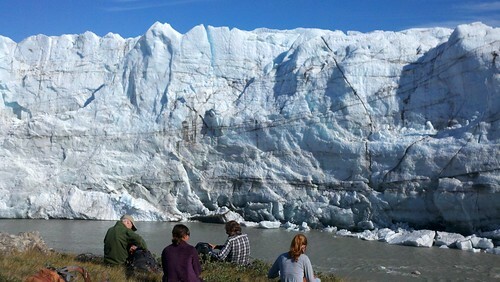 We then hiked to the edge of the Russell Glacier, where truck-sized blocks of ice regularly break off and plummet into the icy waters below, a process known as calving. With front row seats and icy wind stinging our faces, we were all humbled by the magnitude of this active material. It was a show we will never forget. The group settles in for a million dollar view. A tiny IGERT-er perches to give a sense of scale. Photo courtesy S. Gregory. Finally, we concluded the evening with an annual commemorative IGERT procession to the top of the Sea Horse moraine. Here, we marveled at the panorama of ice sheet views, and paid tribute to the late, great renaissance music man, Jerry Garcia. 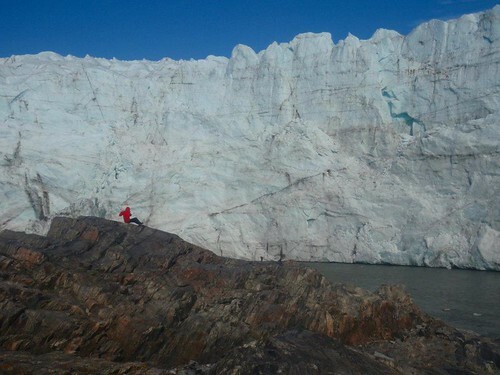 Happy 70th , Jerry, all the way from Greenland! The moon made a special appearance two days in a row. We’re pretty sure it was for Jerry. Photo courtesy M. Ayres. 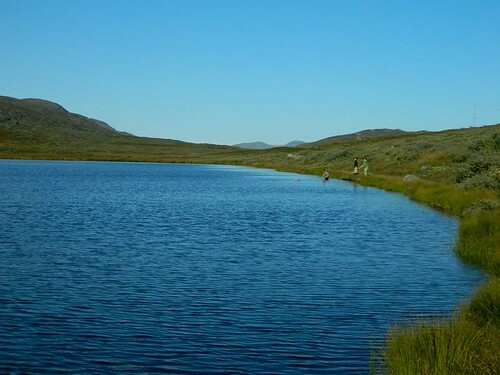 We began our explorations by heading into our own backyard, that is, the valleys and lakes around Kangerlussuaq. 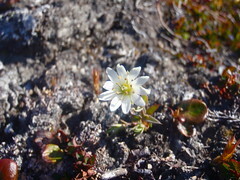 Led by Ross Virginia and Matt Ayers, we headed to a couple sites about 5-10 miles out of town, where we familiarized ourselves with some of common local flora. 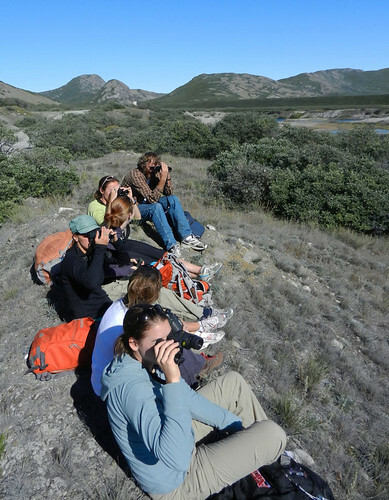 The group lines up to practice proper binocular technique. 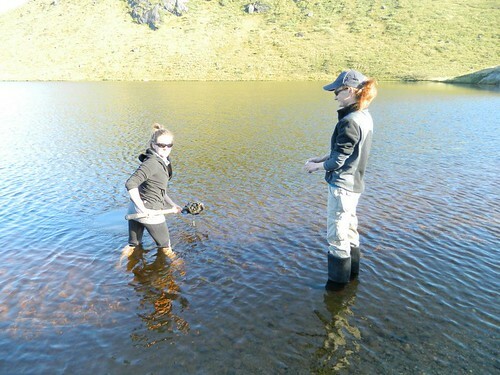 As we were adjusting our diopters, Stephanie spotted two Muskoxen across the river! Photo courtesy M. Ayres. 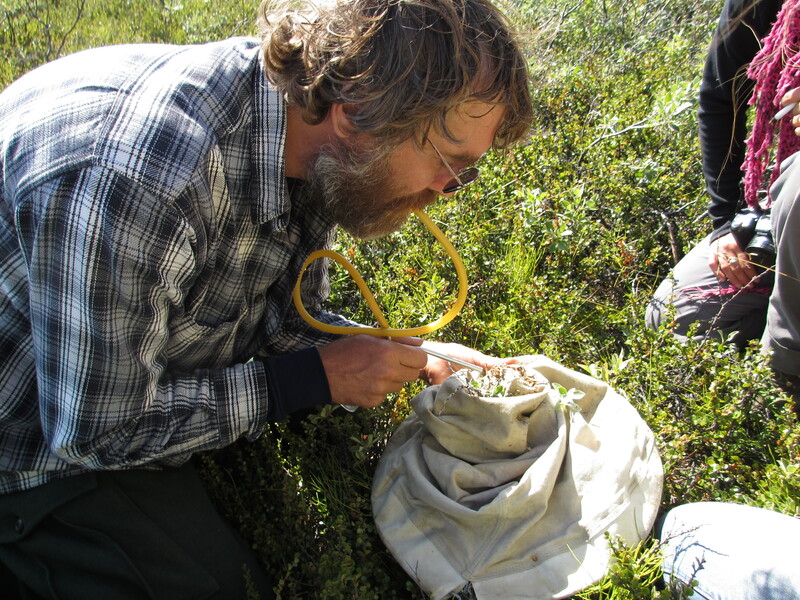 We quickly became acquainted with some of the major players, or foundation species, in this ecosystem. 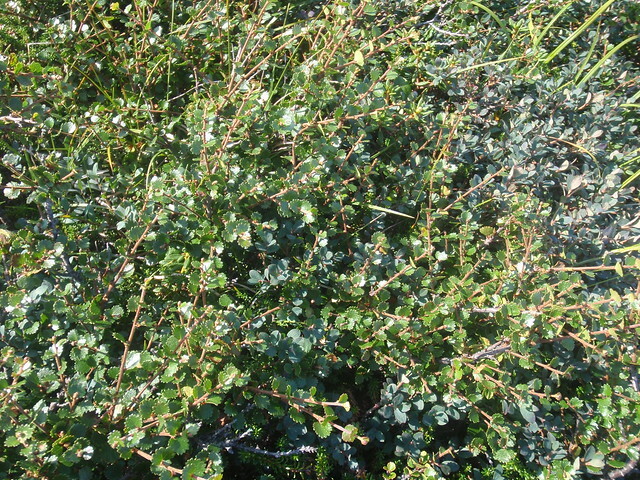 One of the most abundant species we noticed was a low, shrubby plant called Northern Willow (Salix glauca). 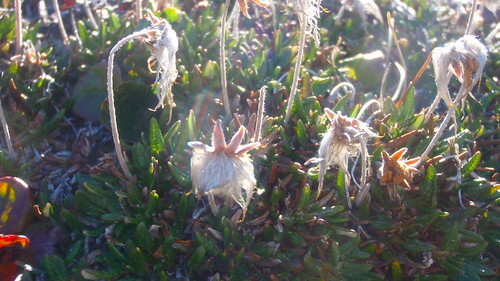 They have oblong leaves about 4-6cm long and these plants are dioecious, indicating that each plant is either male or female. 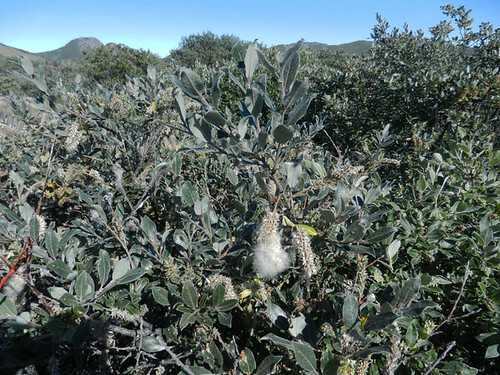 These guys were easy to recognize as they produce small clusters of flowers, called catkins, which appear as fuzzy cylindrical stems. Northern Willow (Salix glauca)- note the distinguishing white flower clusters, called catkins. Photo courtesy M. Ayres. 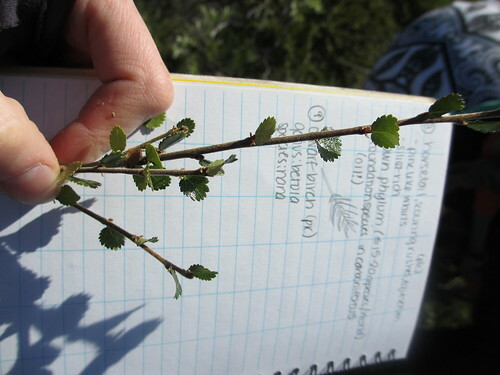 Our next common heath plant was slightly smaller, with rounded leaves, and closer to the ground than the Willow, called the Dwarf Birch (Betula nana). As we walked around, it was clear that Willow and Birch were the two dominant woody species in this landscape. 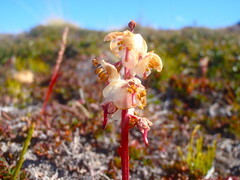 Dwarf Birch (Betula nana). Photo courtesy A. Giese. 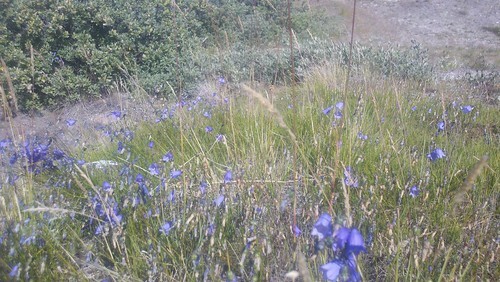 Other common plants in the area included the bright green, highly branched Field Horsetail (Equisetum arvense), and the beautiful blue Arctic Bellflower (Campanula uniflora). 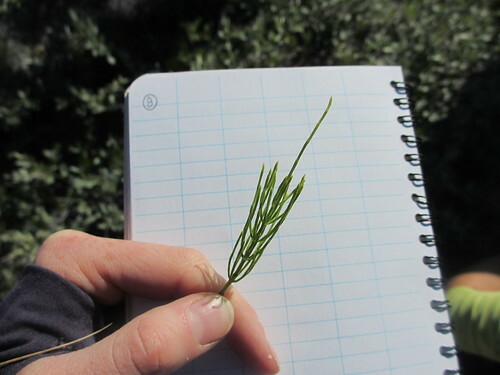 Field Horsetail (Equisetum arvense). Photo Courtesy A. Giese. We’ve also learned the calls and visual markers of the most common birds in this area, including the bright flash of white rump distinguishing the Wheatear (Oenanthe oenanthe), and the red forehead and lightly rosey breast of the Common Redpoll (Carduelis flammea). We’ve also become WELL acquainted with the loud nasal honks and squawks of the ravenous Ravens that guard our dumpster. 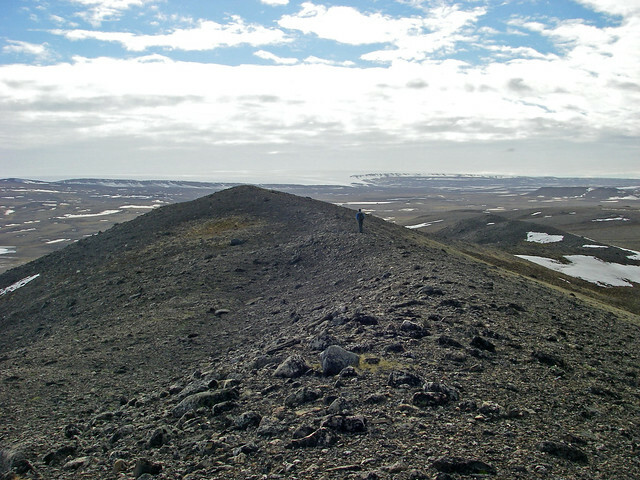 Species biodiversity in the Arctic is quite low compared with ecosystems that have more tolerable abiotic conditions, less geographic isolation, and more complex food webs. So one of the most satisfying things about working here is how quickly we can have a handle on identifying species! 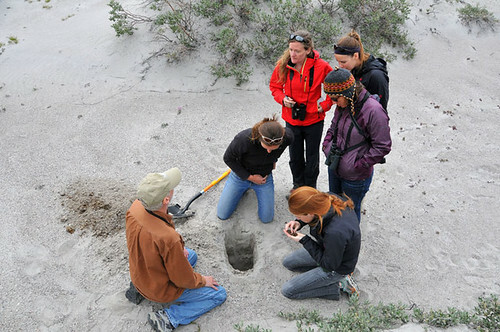 Lee takes the lead digging a pit through the sandy dunes in search of key morphological features, such as the sticky root sheaths and small white root mycorrhizae. Photo courtesy A. Giese. Ross describes the change in composition and organic matter as go deeper through the soil layers. Photo courtesy M. Ayres. Next, we tested our reflexes and dexterity through catching fish with our bare hands (yes, we all succeeded! 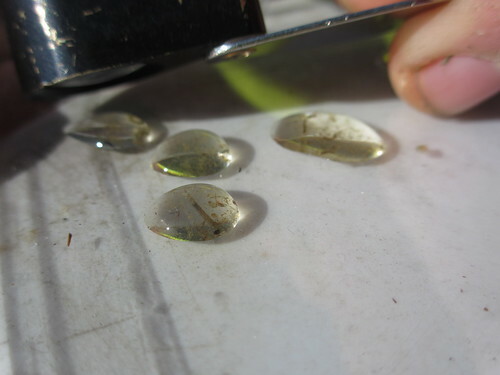 ), after which Matt proceeded to shock, amaze, (and test our gag reflexes) as he carefully sliced open the bellies of the Sticklebacks to reveal the slender, pink, squirming parasites living inside. 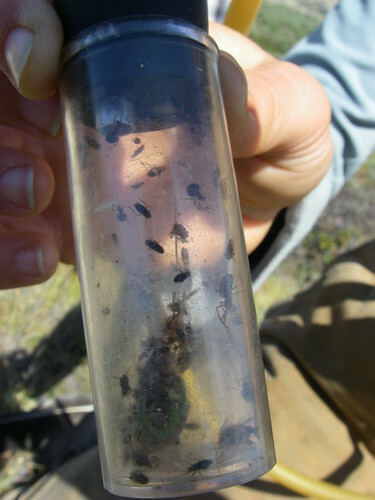 Almost the entire Stickleback population in this lake is infected by this flatworm, observable by the large, distended abdomens displayed by these parasitized fish. The biology of these Schistocephalus worms are fascinating – Stickleback are actually just one of three different hosts necessary to complete their life cycle! 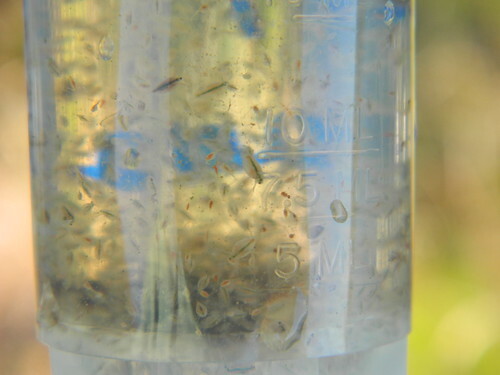 In fact, these parasites take full advantage of the food web: they start by infecting zooplankton in the water, are then passed onto a planktivorous fish host (like the Stickleback), and are eventually snapped up and passed into their final host stage, a bird! 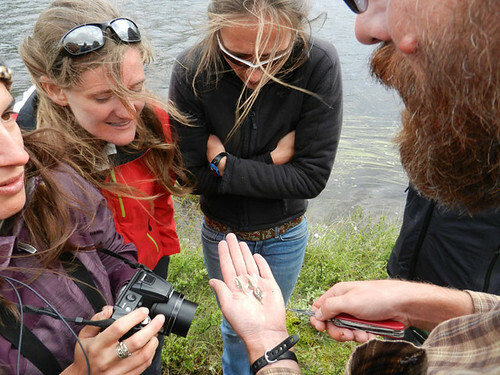 The group gathers around as Matt describes what we are about to observe living inside the abdomens of the tiny Sticklebacks we have just caught. Photo courtesy M. Ayres. 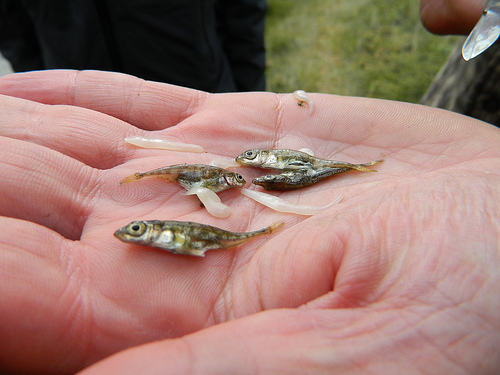 Sticklebacks and the parasitic Schistocephalus worms thriving inside them. Photo courtesy C. Vario. 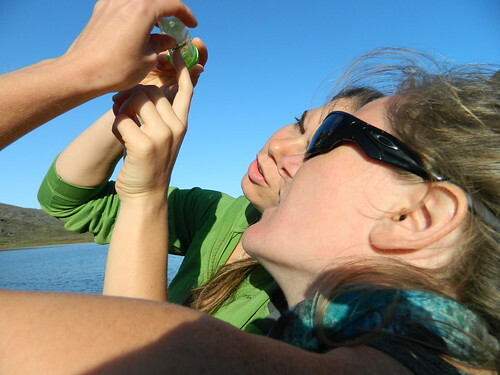 But perhaps one of highlights of our adventures thus far…has been meeting infamous sea tomatoes firsthand! At the end of the day, Ross and Matt took us to one of the highest sea tomato abundance lakes in the area, and it blew away all of our expectations. 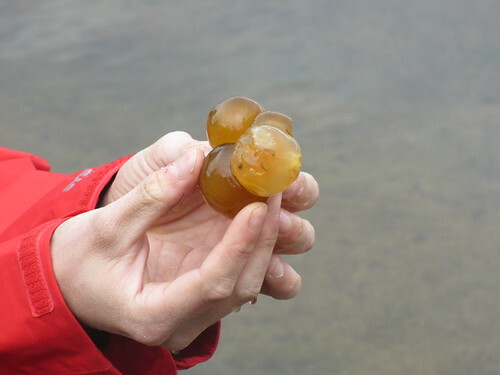 These orange-to-brownish gelatinous spheres are actually colonies of cyanobacteria of the genus Nostoc. Cyanobacteria have a fascinating and unique biology, including the ability to execute three different complex metabolic processes, that is photosynthesize, respire, and fix atmospheric nitrogen! However, while this particular lake bed is covered in sea tomatoes, neighboring lakes appear to have little to none at all. Are they dispersal limited? Nutrient limited? This remains one of the biggest mysteries surrounding their abundance and distribution in this area…and one which we are hoping to tackle as we brainstorm these next couple weeks! 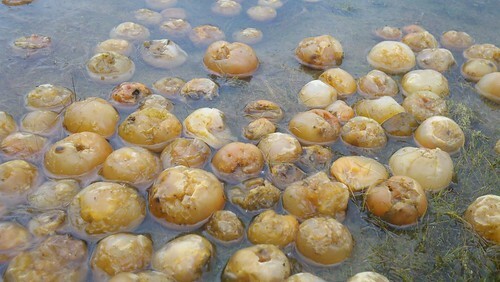 Sea tomatoes clustered around the edge of the lake. Most of the sea tomatoes we found occurred as individual spheres, but occasionally we found them as multiple fused together. Photo courtesy A. Giese. Last (but certainly not least), we used our investigative power to assess the effectiveness of chocolate cake on happiness and satiation in Arctic scientists. Results – it is highly effective!